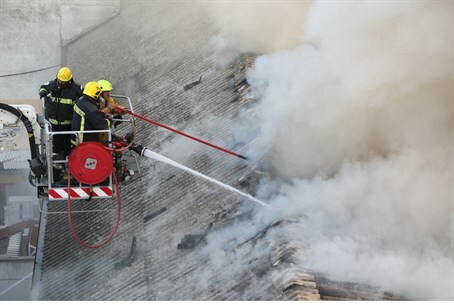 A Tel Aviv blaze brought out five firefighting crews to fight a blaze, just hours after another fire at the landmark El Al Building. A fire at an office building in downtown Tel Aviv brought out five firefighting crews to fight a blaze in the seven story Carasso Building, just hours after another fire caused a set of stairs in the landmark El Al Building to collapse. Both fires were brought under control soon after breaking out. There were no injuries reported in either one, although the damage in both were significant. Firefighters said they were investigating the cause of the blazes, but said that the unusually hot weather Wednesday – with temperatures in excess of 38 degrees celsius (100 fahrenheit) was likely a contributing factor. The Carasso Building fire was visible from most vantage points in the city's business district, including from the Ayalon Freeway, which runs next to the building – and where traffic came to a standstill as rubberneckers gazed at the strong flames and smoke. The fire broke out on an upper floor of the glass-walled building, with firefighters able to safely evacuate everyone who was still inside when they arrived. Meanwhile, further uptown, a fire at the El Al Building, known for its circular staircase, shut down Ben Yehuda Street, one of the city's main north-south thoroughfares. Large chunks of debris – part of the building's outdoor circular staircase, which was meant to be a fire escape, fell to the ground. Miraculously, there were no passerby on the usually busy street at the time, and no one was injured.